Hungry, craving a substantial meal, I searched for a suitable restaurant - close and veggie friendly. 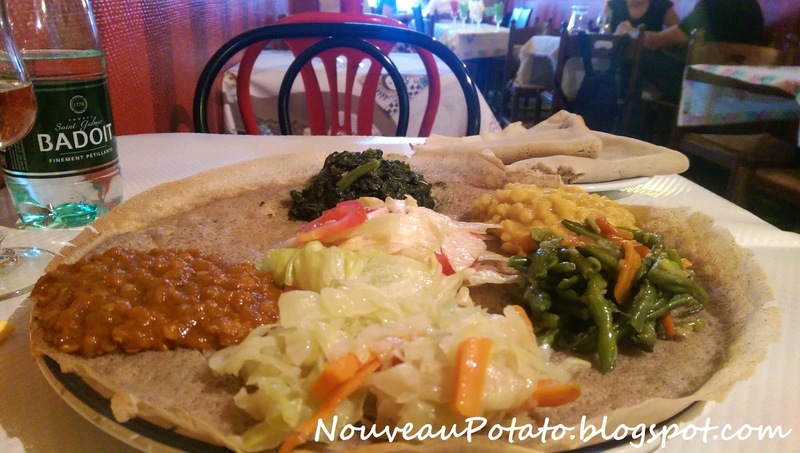 Ethiopia was written up for its vegetable plate, and being only a five minute walk away, I was eager to try it. This was my first experience with Ethiopian food. The interior of Ethiopia is communal and festive, like the diaspora claim the food should be. Tables of large groups were enjoying their conversations and shared platters that they dug into with their hands and excitedly gobbled down with wine. For a solo diner, the food is less festive, but equally tasty. The vegetable platter came with a variety all served on the flat bread, Ingera. This bread has been a staple to the Ethiopian diet for centuries, is made from teff flour and is gluten free whilst being high in iron and calcium. The bread was yeasty with a tasty like yoghurt. Its texture was in between a crumpet and a pancake. The carrots held a nice texture with the cooked skins served with beans. The yellow lentils had been crushed and cooked with spices. The red lentils were my favourite with strong, tangy, addictive flavours. I surprisingly really enjoyed the cabbage and spiced beans. Each serving was intensely and uniquely flavoured. Round one of trying Ethiopian cuisine turned out to be a win. Ethiopia is open every day till 3:30pm for lunch and from 7:00pm for dinner. Bookings are recommended for weekends and large groups.